By Chris Williams: Manny Pacquiao (54-5-2, 38 KO’s) could be at the end of the line on November 23rd if he gets beaten by Brandon Rios (31-1-1, 23 KO’s) in their fight in Macao, China, says his promoter Bob Arum. A defeat for Pacquiao would be his third straight defeat. It might not be the end for Pacquiao in terms of him remaining a viable pay-per-view star, but it might be the end of his career as far as being a major player at 147. Pacquiao could always move down to 140 or 135 to try and reinvent himself if he wasn’t afraid to look like he’s given up on the 147 lb. division. Pacquiao would have to be pulled backwards by Arum against lesser opposition or at least lesser punchers if Rios does him. That would be second straight knockout and a clear sign that something isn’t right. 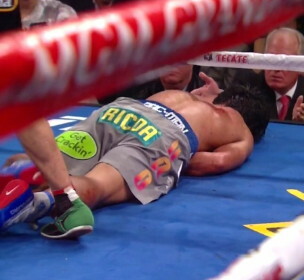 There’s no shame in Pacquiao getting knocked out by Rios, but at the same time it would give a pretty good indication that Pacquiao isn’t a major player at 147. To be sure, Pacquiao could stubbornly stick it out at 147 and persist against Arum’s Top Rank stable fighters, but I think it would be a bad idea for him to do so. If Pacquiao can’t even beat a fighter Rios then he could end up as little more than a trial horse for Arum’s other stable fighters. Pacquiao would be better off doing what other fighters do by dehydrating down from a higher weight to fight smaller guys. Pacquiao could move don to 130 and still be a terror in facing the likes of Mikey Garcia, Roman Martinez and Takashi Uchiyama. I wouldn’t bother having Pacquiao move to 140 because there just isn’t enough Top Rank fighters for him to fight in that weight class for it to be a worthwhile move for him. Also, those guys can punch, and he’d be in danger of getting knocked out again. Rios was picked out because he supposedly has the perfect style for Pacquiao to take advantage of due to his come forward style of fighting. This is a Ricky Hatton type of opponent, and we saw what Pacquiao did to Hatton in stopping him in two rounds in May of 2009. That was a younger, and faster Pacquiao and I suspect that Arum might have forgotten that Pacquiao has aged since then and isn’t the same fighter physically as he was back then. At the same time, Hatton dropped a ton of weight to get down to fighting weight for that fight, and he had reportedly been hurt by one of his sparring partners in training camp in getting ready for Pacquiao. Hatton also had a new trainer at the time in Floyd Mayweather Sr., along with another trainer. It was pure chaos for Hatton in his corner with two trainers telling him things at the same time.